The three-man backline hasn’t returned because it never truly went away. Always in use by one team or another, always an option in emergency. Instead, what it has done, is return to prominence at the top; with the Premier League providing the most obvious examples. Why? With La Salida Lavolpiana, build-up is started by the defensive midfielder dropping between the centre-backs who in turn move into the channels. With a ‘situational’ back three established the full-backs then move further up the pitch to occupy the wings. Named after practitioner Ricardo La Volpe, his ‘exit’ is easily applied to the fundamentals of Juego de Posicion. Specifically, the occupation of the 5 vertical columns of the pitch. In the grander scheme of Juego de Posicion, this achieves multiple things. As well as occupying the channels at the back, the full-backs pushing up to occupy the wings in attack means the wingers are then free to tuck into more central positions. Now the five verticals are occupied in attack too. 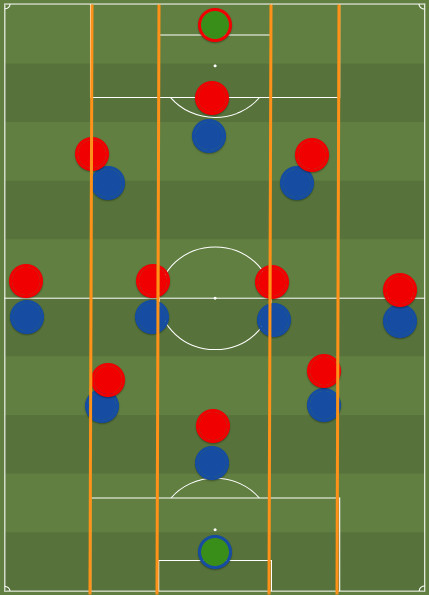 Juego de Posicion is built around playing against a 4-4-2 defensive shape, still by far the most common defensive shape. 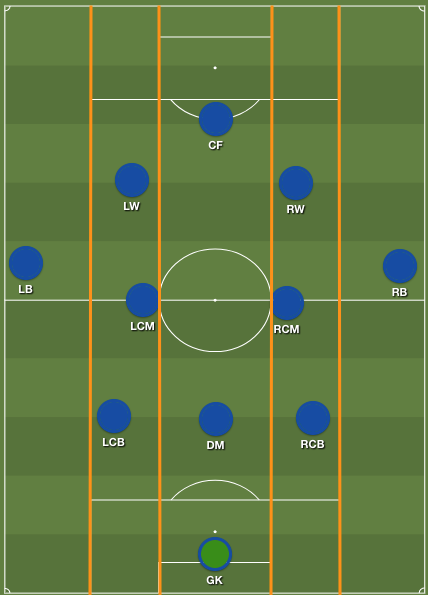 The adoption of this situational shape creates a 3v2 at the back, and a 5v4 up top. Occupation of these zones stretches the opposition to defend a wider area than they would like. This opens up space for the players in the centre and helps to provide connections throughout the team. As world football sees teams press higher and more aggressively the 3v2 at the back becomes just as important as the 5v4 up top. With the reasoning behind the situational back 3 explored, we now need to establish the trend for it’s more permanent use. Perhaps the rise of the permanent back 3 was inevitable following the rise of the situational. I would argue that it primarily comes down to personnel. Though, this is not a contradiction as the development of personnel could well be a result of how the situational 3 has changed player demands. Firstly, the situational 3 ideally requires a player who is comfortable playing in both defensive midfield and centre-back positions. This is not a totally unusual skillset but neither is it an especially common one. The increase of La Salida Lavolpiana sees full-backs tasked with the duties of wing-backs but having to do so from their positions in a back 4. This is an unreasonable athletic demand that few can fulfil. Changing to pure wing-backs somewhat lessens the extreme physical demand and by doing so accommodates for more technically or mentally focussed players. With nearly all wingers now ‘inverted’ and the position increasingly being fulfilled by players that would more classically be considered number 10s, they adapt well to being placed more permanently in the channels. Finally, the continuous, gradual improvement of the technical side of the centre-back game means more can be asked of them in possession. With the switch from a situational 3 to a permanent one the emphasis to push into midfield and make the play shifts from the central player to the two wider ones. The modern centre-back can be relied upon to play quality passes and carry the ball up into midfield or out wide. Conte, Pochettino and Guardiola all use their most technically gifted defender (Luiz, Alderweireld and Stones, respectively) in the central, deep role due to the difficulty and risk that comes with receiving the ball as the lone, deepest player against pressure. This personnel selection enables the aggression of the wider defenders when in possession. 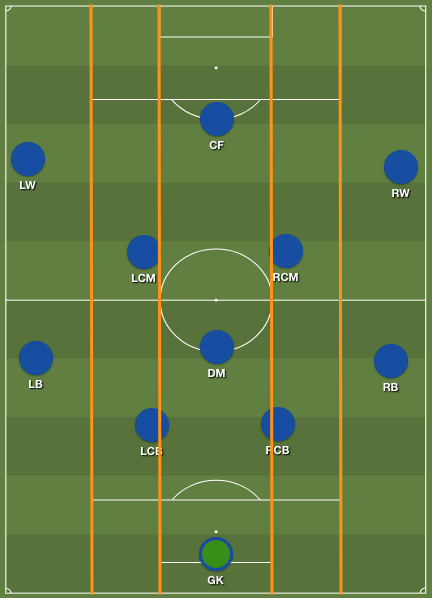 Since the initial rise of clubs with suitable squads making use of the back 3 shape for reasons explored previously; a number more seem to have adopted the shape seemingly for little other reason than because it was popular with good teams. Teams such as the England National Team and Arsenal who had previously shown little inclination to structure possession around the occupation the 5 five verticals are now doing so almost by accident. But adoption of back 3 goes beyond other attacking teams and into the realms of more defensive ones. And this stands to reason. Because the power of occupying the five verticals stems from playing against a 442 and the 5v4 situation that it creates; that in turn can be nullified by matching the 5 across the back. 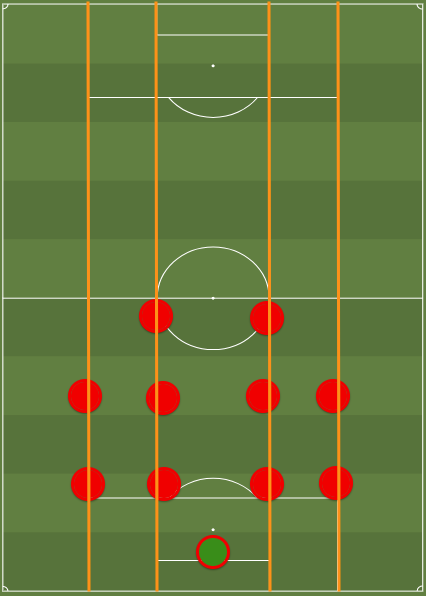 Additionally, teams pressing high in a 343 shape are able to once again match the opposition backline. Negating the advantage that was previously there. Can an increase in defensive back 3s, or more accurately back 5s, nullify the attacking threat of the opposite shape on a global scale? And, if so, what does that mean for the validity of the current design of the Juego de Posicion separation of spaces? 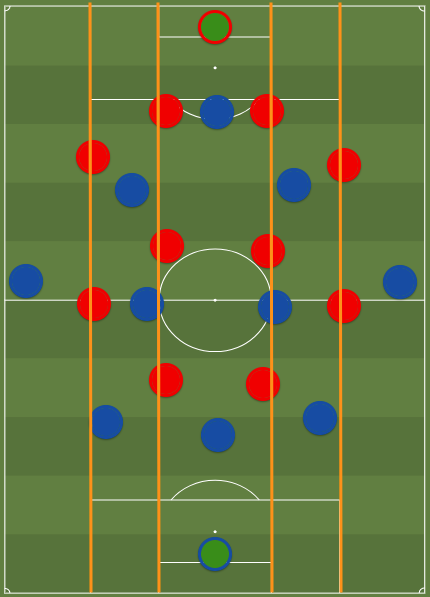 If and when the 5 man defensive shape becomes the norm, should we then refocus the way we look to space and it’s division on the pitch as centred around 6 columns? Then, would attacking occupation of the 6 zones stretch a 5 man defence? Is it possible to occupy as many as 6 attacking zones without losing a general balance? Or instead do attacking teams now cycle back to an older method such as an attacking 442 that focusses on 2v1s out wide and prioritising the ability to convert crosses with large targets?